Falcons fall to Lakers in nonleague contest, 45-13, now prepare for Pacific Conference slate. In the wake of their first loss of the season, a 44-34 loss to Oregon City, the Liberty Falcons looked to right the ship at No. 3-ranked Lake Oswego on Friday, Sept. 28. It didn't go as planned. The Falcons, who expect to be in the hunt for a title in their first year in the new-look Pacific Conference, were eager to test themselves against one of the state's powerhouse programs. They got off to a promising start, too, driving the ball inside the 10-yard line on the game's opening drive. However, in what was the unfortunate theme of the night for the visitors, Liberty did not seize the opportunity, fumbling the ball away on first-and-goal due to what quarterback Brad Norman described later as a "miscommunication." 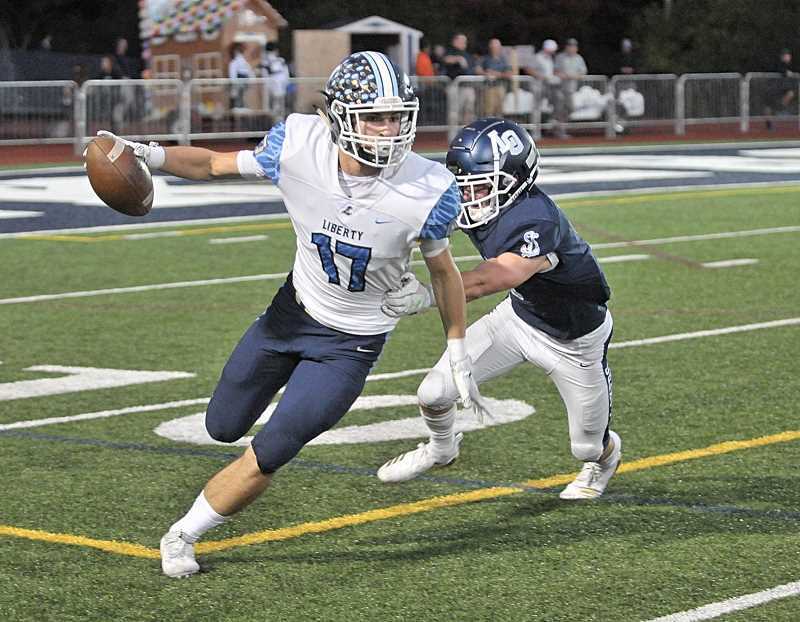 Two plays later, Norman's Lakers counterpart, Jackson Laurent, connected with Thomas Dukart on a five-yard hitch, which the junior wide receiver turned in to an 86-yard touchdown by beating his man to the edge and racing home from there. Lake Oswego added touchdowns on its next two drives to put the Falcons deep in the hole and rolled to a 45-13 victory. "It wasn't mistakes on the X's and O's, it was more that we couldn't capitalize," Norman said. "I fumbled near the endzone and that was on me. We had a few dropped passes, a 14-point swing and then another red zone mistake. We made simple mistakes and we're going to have to learn how to capitalize if we're going to be successful." Liberty coach Eric Mahlum's squad did finally shake off that slow start, putting together a 17-play, 90-yard scoring drive that made it 21-6 with seven minutes remaining in the second quarter. Norman, who caused the Lakers' defense problems with his running and passing, found junior Marquis Brown for a 14-yard touchdown pass to cap the drive. 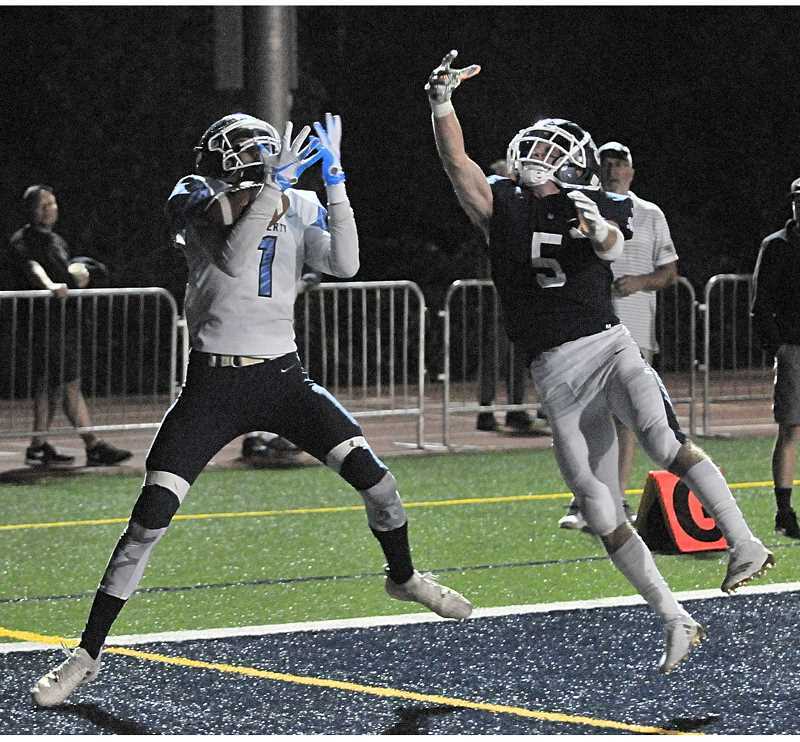 Liberty caught Lake Oswego off guard with an onside kick, but could not convert the ensuing possession into points despite moving the ball to the six-yard line for first-and-goal. A pair of losses, including a sack by Chris Todd and Mike Mercep, pushed the Falcons back to the 19, and they came away empty after a pair of incomplete passes. Lake Oswego followed up by scoring on its first two drives of the second half, on short touchdown runs by Gabe Deville and Filkins, to go up 42-6 with 3:26 left in the third and put any thought of a Falcons comeback to rest. Filkins rushed the ball 10 times for 64 yards, caught four passes for 38 more, and scored three touchdowns. Laurent completed passes to seven different receivers on the night, finishing 15 for 22 for 306 yards and four scores. "The stats probably show I played a pretty good game, but I was definitely not perfect, and there's a lot of stuff I need to work on, especially my deep balls and mid-game," Laurent said. "With the guys that we have, I get the ball in their hands as quick as I can, let them do their thing and they'll get the yards." "We kept competing, and we came back," Mahlum said. "We could have easily just folded up our tents, but we got that last score." After opening the season 3-0, Liberty has now lost two straight (against Oregon City and Lake Oswego) and will regroup to begin Pacific Conference play with a home game versus Glencoe at 7 p.m. Friday, Oct. 5. Liberty played a highly competitive non-league schedule — by design — and Mahlum believes it's that tough schedule that will make them a better team and viable conference champion going forward. "It's a good experience for our guys to play this team," Mahlum said. "We set goals to be prepared for the playoffs by playing a tough non-league schedule, and we did. Lake Oswego is one of the top teams in the state, in my opinion, so our guys know what it's like to contend with that going into league play. It's time for us to get ready and see what we can do." Wade Evanson contributed to this story.